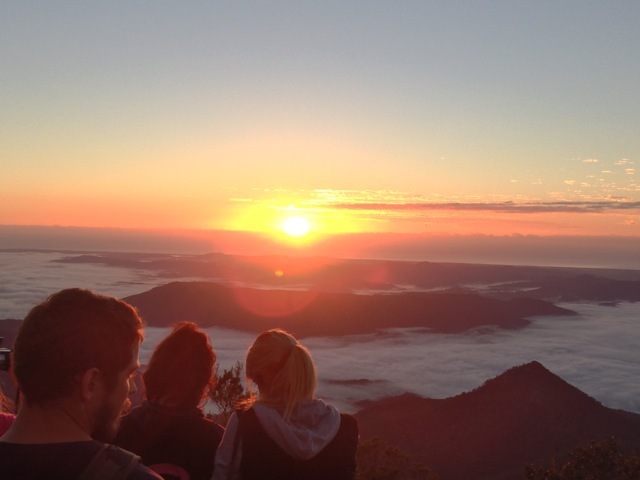 Watching the sunrise on top of a mountain is a bucket list favourite. Achieve your tick on Mount Warning, which sits majestically in the top NE corner of NSW, within easy travelling distance of the Gold Coast and Brisbane. 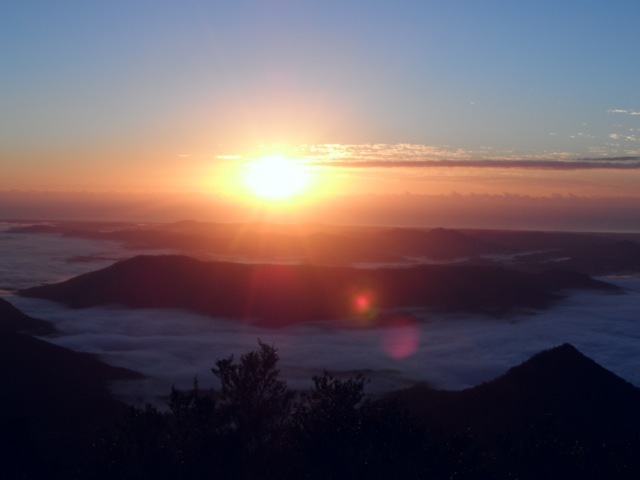 Mt Warning is reputed to be the first place in mainland Australia to see the sun rise. 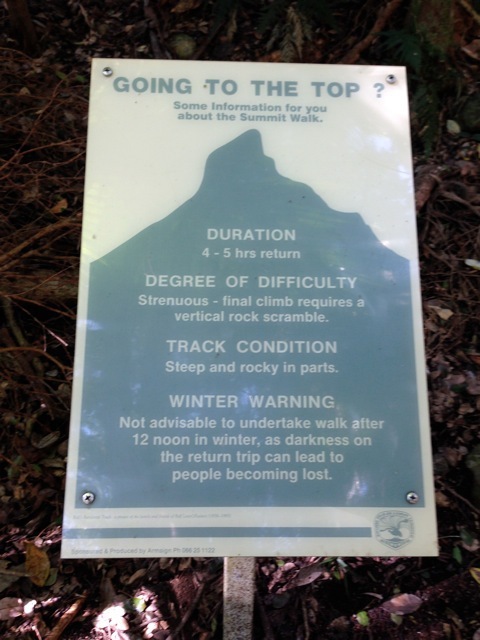 This makes a Mount Warning climb very popular on the 1st of January each year, as a significant way to welcome in the New Year (NB the sign on the platform at the top says that only in winter is Mount Warning the first to get the sunrise and that Cape Howe is the first in summer). It's a popular place to climb for a special birthday. It's also a great experience to share with any overseas visitors you may have. 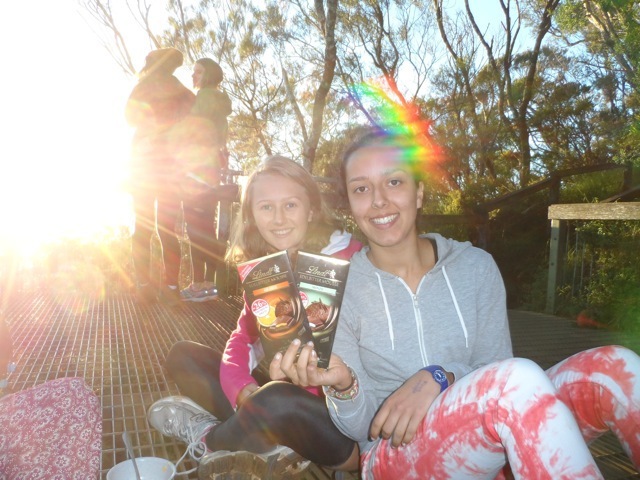 We recently hosted a German student and this was one of the highlights of both her holiday and ours. 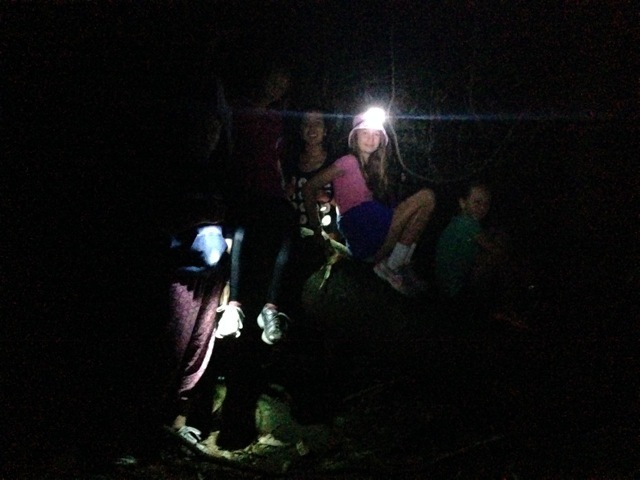 Climbing the mountain in the dark, by torchlight, is all part of the experience. Reaching the summit in time to watch the sunrise and watching in wonder as the sun's rays burst over the horizon and light up the morning sky, is the prize for your efforts. At the same time as the light unmasks the surrounding countryside, the low cloud below dissipates to reveal green valleys below. The views are 360 degrees of the Byron Hinterland. Clear days reveal ocean views as far as Surfers Paradise and the Byron Bay lighthouse. Captain Cook named it Mount Warning, but to the Aboriginal community it is known as "Wollumbin", meaning "cloud catcher". Being at the top of a mountain in time to see the sun rise means setting off from home in the middle of the night. We left the Robina area on the Gold Coast around 2.15am, drove south to Mt Warning and were ready to leave the car park at the base of the mountain at exactly 3:30am. The climb took us just over two hours. There is a certain pressure to keep going, as you don't want to miss the sunrise, otherwise you could have set off at a more civilized hour and not in the dark. It's 4.4 kilometres each way, giving you around a 9 kilometre return hike. The last 400m section is a near vertical climb over rocks, with the aid of a chain handrail to pull yourself up. The predawn light is enough, by the time you reach this part, to comfortably climb without having to hold or use your torch. We took longer on the descent, as there was no time factor and we stopped a lot to look at and photograph the views and the beauty of nature. (Note: Our timing reflects an Easter climb, dawn times will vary throughout the year. For us, we enjoyed watching the dawn and taking photographs, between around 5.45 and 6.15am). 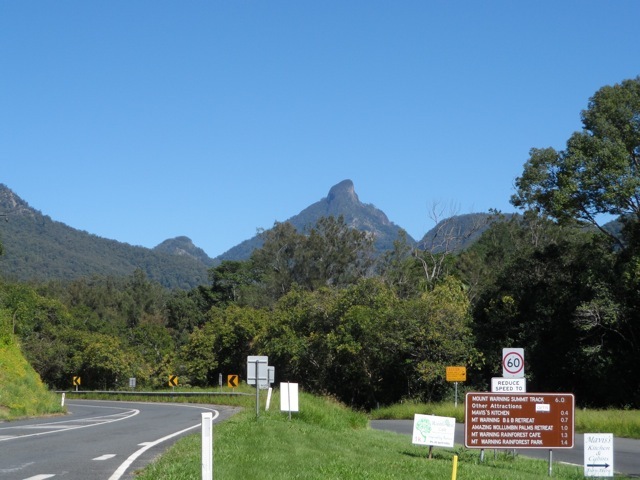 The Mount Warning climb doesn't need any specialized equipment or call for you to be super fit but it is a challenge and you will feel a real sense of achievement as you return to the foot of the mountain. The best part is when you look back when driving home and see the mountain rising in a high peak over the surrounding countryside - you didn't catch sight of the summit when you arrived, as it was dark. It's only then you realize "I was at the top of that" only hours before and feel justifiably proud of your effort and achievement. 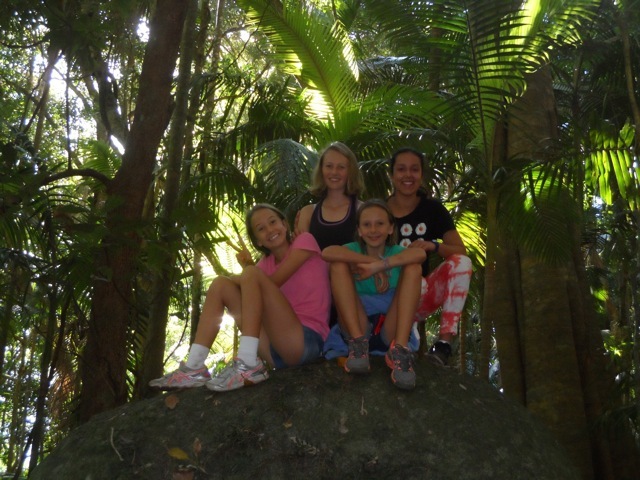 Our youngest daughter was 7 when we did a day hike and was 11 for the night hike. Accomplishing a day hike first with kids is a good idea, then you are happy that your group will manage (and enjoy) the night version in time for the sunrise. It's a great adventure with kids who are capable of the challenge. Wearing head torches, discovering glow worms along the way, seeing the stars through breaks in the canopy, climbing the final rock section and best of all, watching the sun burst over the horizon at dawn, at the top of the mountain, will form a lasting family memory. Note: You know your own child best in terms of how up for the challenge they will be, together with their fitness level and how much they enjoy hiking. You can pace it to suit your group. Just be aware that this is not a walk you want to be carrying your children on. 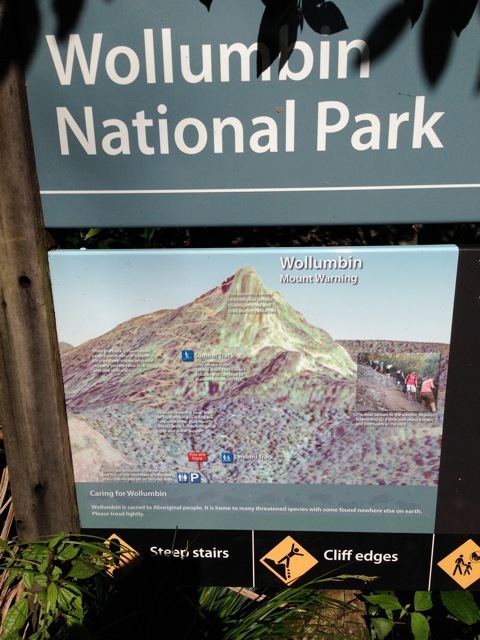 The sign at the beginning does categorize the route, under degree of difficulty, as "Strenuous – final climb requires a vertical rock scramble". It's certainly not a walk in the park. Definitely take food to eat at the top. 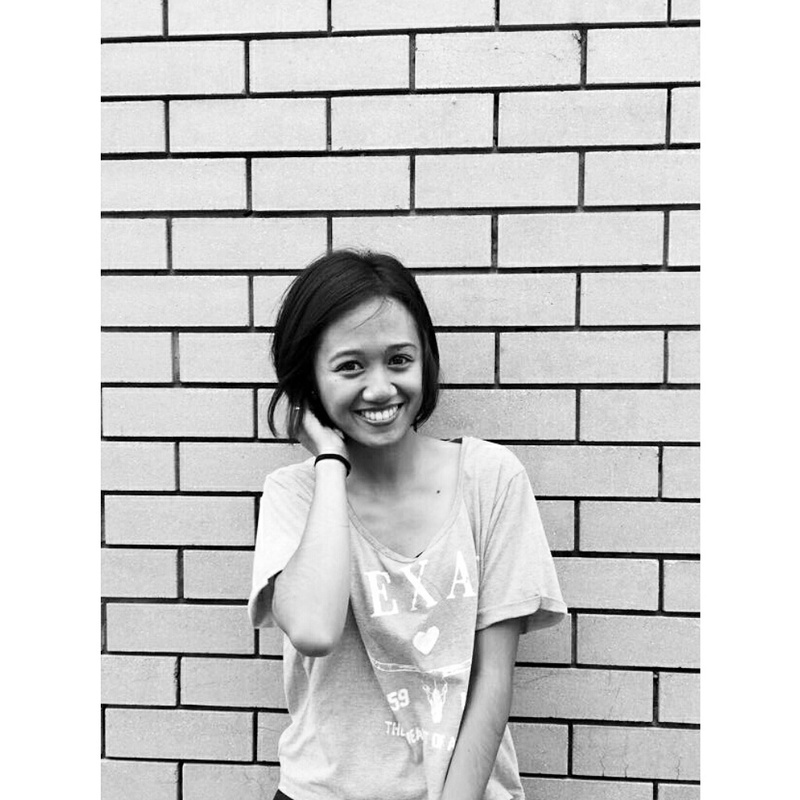 Carry something light and energy giving. We also took fruit juices and water. A torch each is a must for the night hike. It was pitch black under the canopy, despite it being a clear starry moonlit night when we climbed. A head torch is best as it leaves your hands free. Wear footwear that has good grip and supports your ankles and at the least wear a running shoe. Slops/thongs/ flip flops are not recommended. Waiting for the sunrise at the top can be cool, especially if it's windy. We walked at Easter (autumn) and needed a jumper at the summit. I imagine it would be cold in winter. When you are on the move, it's fine - you will sweat on the way up. You don't need a map, as the trail is well established. 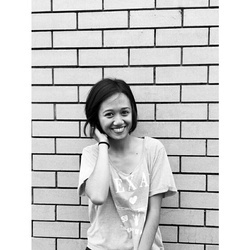 As long as you stick to the track and don't take short cuts, you aren't likely to get lost. The height of Mount Warning is 1156 metres. 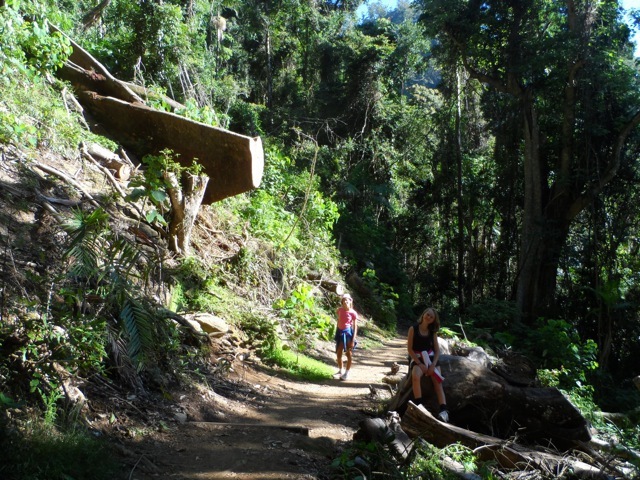 Our hike was in April 2014 and the trail had not long reopened (Sep 2013), 8 months after the destruction by ex tropical cyclone Oswald in late January 2013, which caused severe forest damage. Huge trees can still be seen lying on either side of the trail with gaps cut through. 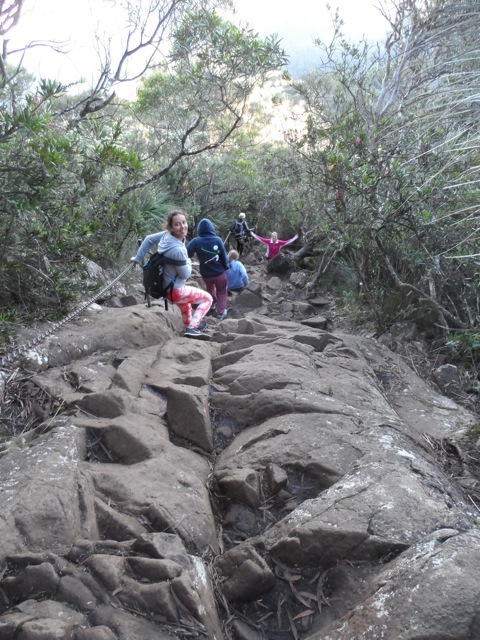 The track zigzags up the mountain, where you will encounter "subtropical and temperate rainforest, wet sclerophyll forest and heath shrubland" The final section "requires scrambling up a rock wall, using a chain and foot holds in the rock" (Aussiebushwalking.com). You don't need a permit and there is no cost. Toilets are provided in the car park (long drop) but not on the mountain. Note that the summit is sacred to Aboriginal people and overnight stays and fires are not permitted. 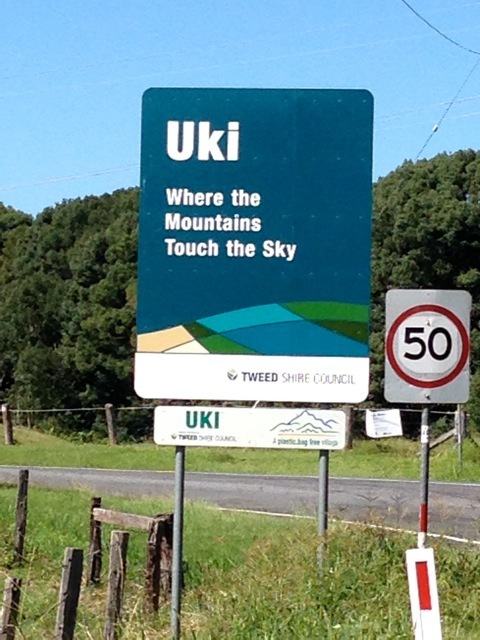 Having heard a bit about Uki and seeing that it was only 4 kilometres from our turn for home at the bottom of the mountain, we took the detour to experience Uki for ourselves. We found a small historic village "where the mountains touch the sky", with a community of around 200 people. It has an alternative feel and the main street is dotted with shops with a charm of their own. From Happy Herbs to Antiques, Astrology Readings and Village Treasures, it's a good spot to browse and enjoy an ice cream from the supermarket. If you started your hike at 3.30am then by lunchtime you have time to waste, as it feels like 5pm and it's barely passed noon. So what's next on your bucket list? What a great article. So informative with the links making it easy to read the relevant info..
May not be fit for the climb, but enjoyed it through your article and Uki is indeed a special little village. It must be a tough hike, but the view and feeing of pride at the end sounds worth it.